Endless runners are simple games. The genre, popularized by titles such as Temple Run and Jetpack Joyride, has players running endlessly and grabbing coins. Well, for one young man in China's Macao, the endless run's earned him a paycheck of over $3,000. The Communist Party newspaper, People's Daily, reports that insurance salesman Zhou Yongjian walked away with a 20,000 RMB (that's a little over $3000) prize in a nationwide Tencent-sponsored competition for Tencent's endless runner, WeChat Dash PVP [天天酷跑 Tian Tian Ku Pao]. The game is a simple endless runner similar to Jetpack Joyride. Players can customize their avatar and purchase weapons and rides. The game is free to play and is incredibly popular in China, consistently making the top 10 on the Chinese app stores. The "competition," held in 34 different cities, had players try to "outrun" each other in the mobile game. Zhou came out on top with the best time and distance. According to People's Daily, Zhou's game ran for over an hour and 50 minutes. In game terms, his character ran over 100,000 meters. The news reports say that Zhou is an avid mobile gamer and has been playing the Tencent runner since it first came out. He has reportedly spent only about $8 on in-app purchases for the game. According to the news report, Zhou's sort of famous in the Tian Tian Ku Pao circles. 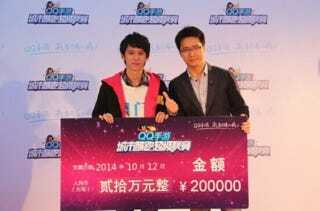 Going by the online handle "Xi Lizi," he has posted videos of his gameplay online. He says that spending only $8 and winning over $3,000 is amazing. It's reported that Zhou, a new father, will be spending the money on formula for his child!